Played the Music at The Creek Festival. Was a lovely festival shrouded in mist and peopled by lovely grounded folk who know how to live with a song in their heart and a spring in their step. Thanks to all for a rejuvenating week-end! 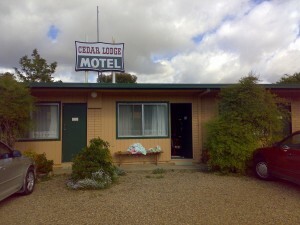 The Motel we stayed at (yes we cheated!). The friendly lady who took care of us informed us that Mick Jagger had stayed there when he was filming Ned Kelly… funny….